Since Minto‘s Quantum was released eight years ago, condo development in the Midtown area (Yonge / Eglinton) has seen a noticeable increase. Before 2003, you could purchase a one bedroom plus den for $225,0000. Today, I estimate those units are worth $380,000, if you can find one for sale. On MLS, there are very few listings in the area to choose from; you can buy a penthouse suite for $1.6 million or a two-bedroom unit for $400,000. For anyone who’s familiar with Midtown, the area offers nightlife activities for anybody’s tastes, with restaurants, nightclubs, pubs, and movie theatres. For years, it has been a hub for local twenty-somethings—so much so that it earned the nickname, Young and Eligible. But that seems to be shifting now with new condos coming on stream that are attracting upscale professionals to the area. The neighbourhood’s landmarks, Philthy McNasty’s, Golden Griddle and Chick N’ Deli, are still part of the social fabric, along with the Yonge Eglinton Centre, which offers plenty of shopping within walking distance. Still, there is a sense that Midtown is going a little more upscale and cosmopolitan in its appearance. In short, Yonge and Eglinton is an area where demand is greater than supply. Any homes on the market are selling fast—sometimes with bidding wars. The city’s future plans for a new LRT line should only improve investor returns, so there is still room for prices to go up. For first time buyers, the starting price point may be difficult to reach with a $40,000 salary, so a rental option may be the most cost effective way to live in the area. One upcoming Midtown condo project worth mentioning is the redevelopment of the York Cinema site by Madison Homes (located at Eglinton and Dunfield—two blocks east of Yonge on Eglinton). This two-tower complex will add new housing stock in the area—644 suites to be exact. These buildings are entering the public phase of the project launch with the remaining 200 suites now on sale. The first batch of suites was purchased primarily by investors who can leverage the strong rental market, earning $1600 to $1900 per month for a one bedroom plus den. This is a mixed-use development that will have over 50,000 square feet of new, street-level retail space and a grocery store on the second level. Occupancy for the project is scheduled for the spring of 2015. Midtown continues to prove its worth in the real estate world, and the wise investor would consider the area. With a prime subway location, established neighbourhood and lively social scene, Yonge and Eglinton is one hot Toronto spot. 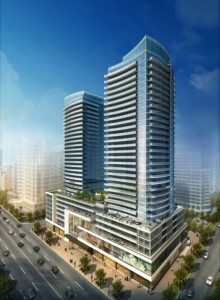 For more info on Midtown Toronto condos and up coming projects, contact me.